SPA Ballet Company will present Aladdin the Ballet on Saturday, May 12th, at 7:30 p.m. and Sunday, May 13th, at 2:30 p.m. 2012 at the Smith Opera House in Geneva, NY. 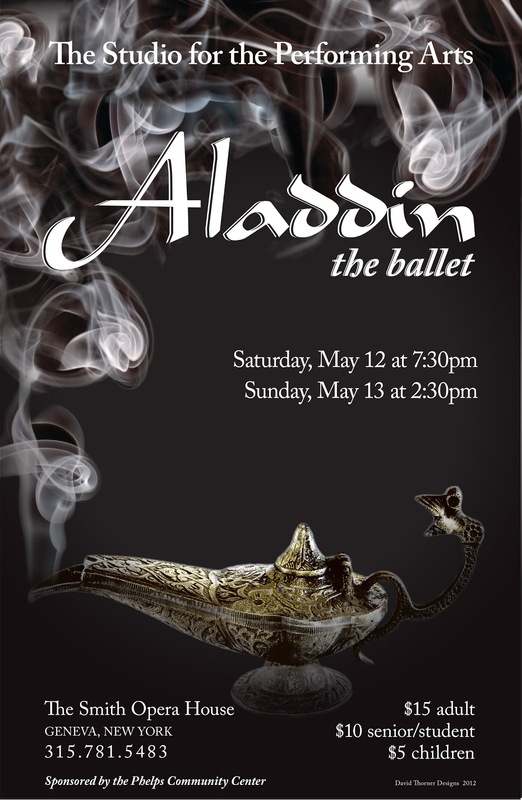 This production is composed of many multitalented dancers who auditioned for the SPA Ballet Company. These dancers ranging from the ages fo three through adult and are representing Ontario, Seneca, Monroe and Wayne County communities. The SPA Ballet Company, through the dedication, diligence, and hard work of the choreographers, dancers performers, costumers, artistic designers and many volunteers have delighted and amazed our audiences in recent performances of Snow White 2011, The Nutcracker 2010 (Land of Sweets), Alice in Wonderland 2010. Hansel and Gretel in 2009, Cinderella in 2008, Peter Pann in 2007, and the Wizard of Oz in 2006. These performances are made possible by the support of our local community members, parents and business sponsors. 0 Comments to "Aladdin 2012"